Tendinitis is the inflammation of a tendon - which the Mayo Clinic describes as the thick, fibrous, cords that attach our muscles to the bone. 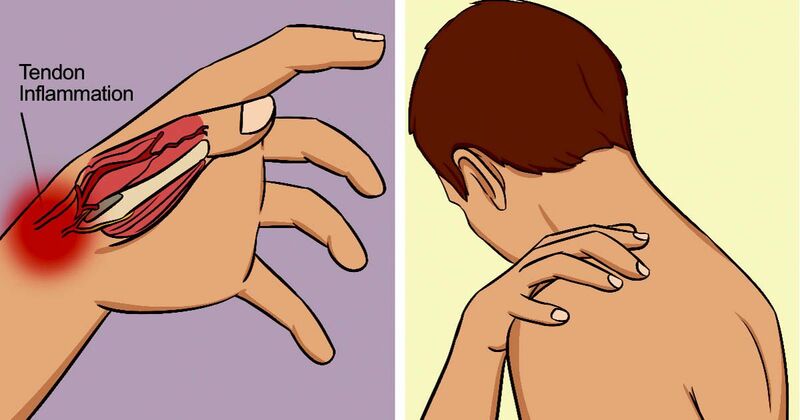 This condition - which is most common in the shoulders, elbows, wrists, thumbs, knees and heels - causes pain and tenderness just around the joint. While tendinitis is painful, it can often be healed with some good rest. But if you don't let it rest, or get properly treated, it can lead to a severe condition that ruptures the tendon - which can require surgery to fix. For these reasons, it's important to understand the signs and symptoms. - Other conditions like: rheumatoid arthritis, gout, psoriatic arthritis,thyroid disorders, or unusual medication reactions. Many times, the Mayo Clinic says tendonitis can clear up when you give your body time to heal. But if you notice that your symptoms are continuing, and getting worse after a few days you should see your doctor. If your tendinitis doesn't improve after about a week of rest, or the pain gets worse you should see your doctor. If your condition has worsened they may prescribe a corticosteroid injection for the swelling, physical therapy, and in the most severe cases surgery.